It’s December 17, which means you’re either done with your holiday shopping spree (in which case, insert celebration dance here), or you’re in the same boat with every other poor soul that’s aimlessly walking the earth in search of the “perfect gift.” Fear not procrastinators, because we’ve got you covered. If you care about somebody enough to give them a gift, odds are you like that person (If you don’t, I have one word for you, “re-gift”). Since there’s no better way to reward your loved ones than investing in their health, here are some gift ideas that will keep them happy and healthy for the long-term. When it comes to water bottles, the Hydro Flask is king. 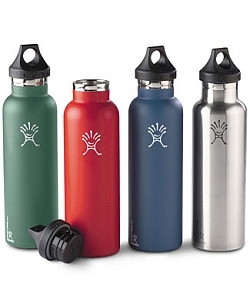 They come in a variety of sizes, and while they cost more than your average water bottle, they’re unbelievable for keeping drinks cold (or hot). Fill a Hydro Flask with ice, and it’ll there for days! No joke, it’ll blow your mind. Smoothies are a rock solid way to get some extra fruit and veggie servings into your diet. The only problem is that they take some prep time, and they aren’t easy to transport. Not anymore! To help the “on the go” crowd speed up the process of getting a smoothie in hand, they created a blender and to-go cup combo. Genius! Preparing vegetables is a pain, unless you have an ultra-easy veggie steamer. The silicone veggie steamer can fold up to fit in any pot or pan, it’s 100% dishwasher safe, and it makes rinsing and steaming a snap. You can even use this thing in the microwave. This is veggie steaming technology perfected! That’s just a sample, but all of these are affordable, and they’re awesome (trust us, we have insiders who have tried all three). If you have another “healthy gift idea,” please share it! There are lots of desperate shoppers out there who would love some ideas (the writer of this blog post included).